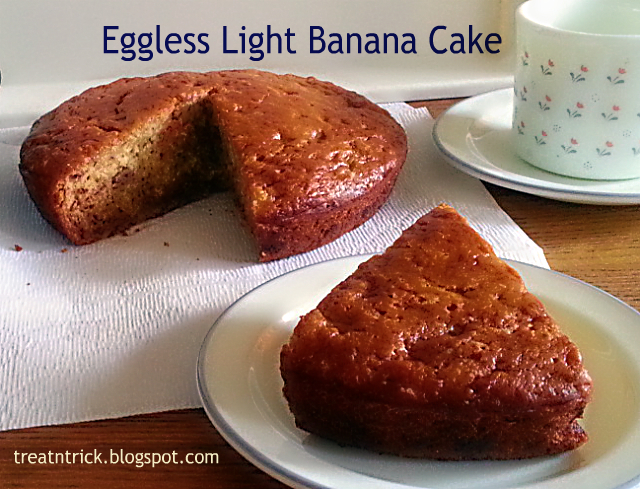 This Eggless Light Banana cake is incredibly easy to make, egg free and very flexible. If you're using self rising flour, you could avoid the baking soda and baking powder in the recipe. Added only half a cup of sugar since bananas are already sweet but add 3/4 cup if you want it sweeter. Also used canola oil and water to moisten the cake. 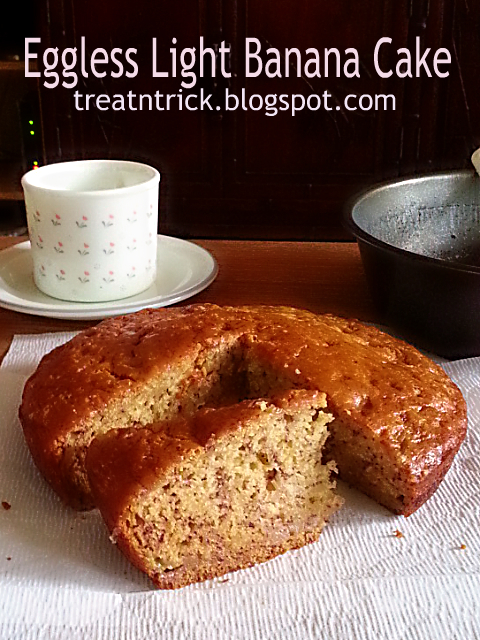 For richer taste substitute water with milk or if you are a coffee lover, feel free to include coffee for making this Eggless Light Banana Cake. 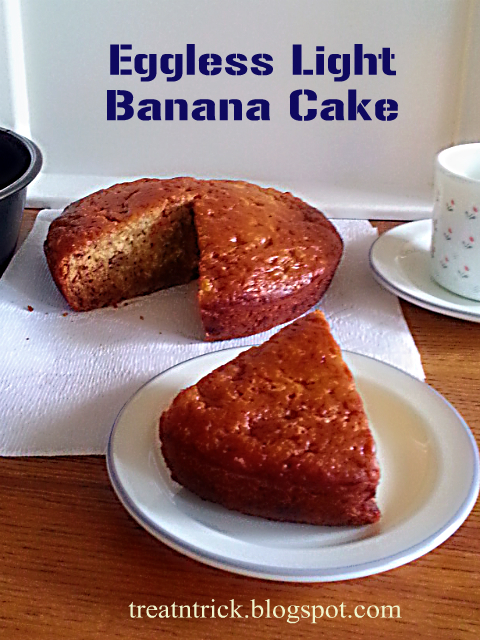 If you don't have time to bake this when your banana are fully ripened, stuff those bananas in a plastic bag and freeze them until ready to make it (thaw them first before using). So pleased with the outcome, the cake turns out gorgeous, extremely moist and no cracks on top. You won't be able to tell this cake is egg free and low in fat. 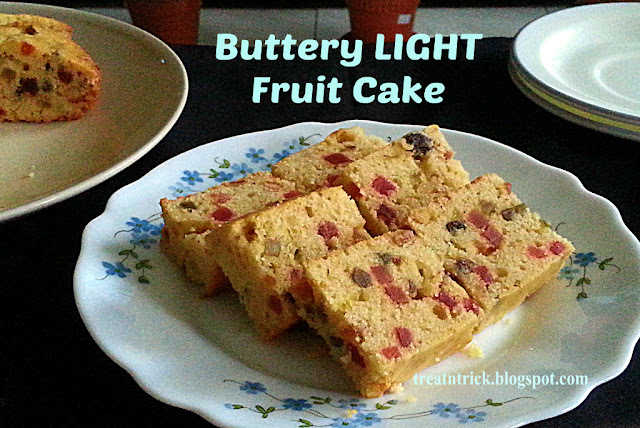 This can be baked in any size pan or muffin tins, just adjust the baking time. Preheat oven @ 170 C. Grease your 7 in cake pan. Sift flour together with baking powder and baking soda. Mix in salt and sugar. Combine banana, oil, vanilla essence and water in a bowl. Stir in banana mixture onto the flour, combine well. Pour the batter into prepared pan and bake for 50-60 minutes or until a skewer inserted comes out clean. Cool in pan 10 minutes, transfer onto rack to cool. Yummy cake..looks soft and airy! I love the way the cake looks like... delicious! Perfect tea time snack. Pass me a piece. This is perfect for lent! I love banana breads! Cooking and Crafting with J & J. We can't wait to see what you will share with us next time! This looks yummy! Thanks so much for sharing your recipe at Share The Wealth Sunday! I have never seen a banana cake before, only banana bread. This looks awesome! Thanks so much for adding your link to the Alder Collective! We hope to see you again next week! Looks yumm. The texture well captured in the pics. Wow, yum! Thanks for sharing at My Flagstaff Home! This looks so yummy! Thanks for sharing :) Found your blog through the over the moon link up. Looks delish - I think i could live on banana breads and cakes! !